This definition of "atheist" comes from pages 105-107 of a book entitled "A Biblical and Theological Dictionary: explanatory of the history, manners, and customs of the Jews, and neighbouring nations" -- it was authored by Richard Watson, and published by B. Waugh and T. Mason in 1832 CE. ATHEIST, in the strict and proper sense of the word, is one who does not believe in the existence of a God, or who owns no being superior to nature. It is compounded of the two terms, α negative, and Θεὸς, God, signifying without God. Atheists have been also known by the name infidels; but the word infidel is now commonly used to distinguish a more numerous party, and is become almost synonymous with Deist. He who disbelieves the existence of a God, as an infinite, intelligent, and a moral agent, is a direct or speculative Atheist; he who confesses a Deity and providence in words, but denies them in his life and actions, is a practical Atheist. That Atheism existed in some sense before the flood, may be suspected from what we read in Scripture, as well as from Heathen tradition; and it is not very unreasonable to suppose, that the deluge was partly intended to evince to the world a heavenly power, as Lord of the universe, and superior to the visible system of nature. This was at least a happy consequence of that fatal catastrophe; for, as it is observed by Dean Sherlock, "The universal deluge, and the confusion of languages, had so abundantly convinced mankind of a divine power and providence, that there was no such creature as an Atheist, till their ridiculous idolatries had tempted some men of wit and thought, rather to own no God than such as the Heathens worshipped." Atheistical principles were long nourished and cherished in Greece, and especially among the atomical, peripatetic, and skeptical philosophers; and hence some have ascribed the origin of Atheism to the philosophy of Greece. This is true, if they mean that species of refined Atheism, which contrives any impious scheme of principles to account for the origin of the world, without a divine being. For though there may have been in former ages, and in other countries, some persons irreligious in principle as well as in practice, yet we know of none who, forming a philosophical scheme of impiety, became a sect, and erected colleges of Atheistical learning, till the arrogant and enterprising genius of Greece undertook that detestable work. Carrying their presumptuous and ungoverned speculations into the very essence of the divinity, at first they doubted, and at length denied, the existence of a first cause independent of nature and of a providence that superintends its laws, and governs the concerns of mankind. These principles, with the other improvements of Greece, were transferred to Rome; and, excepting in Italy, we hear little of Atheism, for many ages after the Christian æra. "For some ages before the Reformation," says Archbishop Tillotson, "Atheism was confined to Italy, and had its chief residence at Rome. But, in this last age, Atheism has travelled over the Alps and infected France, and now of late it hath crossed the seas, and invaded our nation, and hath prevailed to amazement." However, to Tillotson, and other able writers, we owe its suppression in this country; for they pressed it down with a weight of sound argument, from which it has never been able to raise itself. For although in our time, in France and Germany a subtle Atheism was revived, and spread its unhallowed and destructive influence for many years throughout the Continent, it made but little progress in this better-instructed nation. Atheism, in its primary sense, comprehends, or at least goes beyond, every heresy in the world; for it professes to acknowledge no religion, true or false. The two leading hypotheses which have prevailed, among Atheists, respecting this world and its origin, are, that of Ocellus Lucanus, adopted and improved by Aristotle, that it was eternal; and that of Epicurus, that it was formed by a fortuitous concourse of atoms. "That the soul is material and mortal, Christianity an imposture, the Scripture a forgery, the worship of God superstition, hell a fable, and heaven a dream, our life without providence, and our death without hope, like that of asses and dogs, are part of the glorious gospel of our modern Atheists." The being of a God may be proved from the marks of design, and from the order and beauty visible in the world; from universal consent; from the relation of cause and effect; from internal consciousness; and from the necessity of a final as well as an efficient cause. Of all the false doctrines and foolish opinions that ever infested the mind of man, nothing can possibly equal that of Atheism, which is such a monstrous contradiction of all evidence, to all the powers of understanding, and the dictates of common sense, that it may be well questioned whether any man can really fall into it by a deliberate use of his judgment. All nature so clearly points out, and so loudly proclaims, a Creator of infinite power, wisdom, and goodness, that whoever hears not its voice, and sees not its proofs, may well be thought wilfully deaf, and obstinately blind. If it be evident, self-evident to every man of thought, that there can be no effect without a cause, what shall we say of that manifold combination of effects, that series of operations, that system of wonders, which fill the universe, which present themselves to all our perceptions, and strike our minds and our senses on every side? Every faculty, every object of every faculty, demonstrates a Deity. The meanest insect we can see, the minutest and most contemptible weed we can tread upon, is really sufficient to confound Atheism, and baffle all its pretensions. How much more that astonishing variety and multiplicity of God's works with which we are continually surrounded! Let any man survey the face of the earth, or lift up his eyes to the firmament; let him consider the nature and instincts of brute animals, and afterward look into the operations of his own mind, and will he presume to say or suppose that all the objects he meets with are nothing more than the result of unaccountable accidents and blind chance? Can he possibly conceive that such wonderful order should spring out of confusion? or that such perfect beauty should be ever formed by the fortuitous operations of unconscious, unactive particles of matter? As well, nay better, and more easily, might he suppose that an earthquake might happen to build towns and cities; or the materials carried down by a flood fit themselves up without hands into a regular fleet. For what are towns, cities, or fleets, in comparison of the vast and amazing fabric of the universe! In short, Atheism offers such violence to all our faculties, that it seems scarce credible it should ever really find any place in the human understanding. Atheism is unreasonable, because it gives no tolerable account of the existence of the world. This is one of the greatest difficulties with which the Atheist has to contend. For he must suppose either that the world is eternal, or that it was formed by chance and a fortuitous concourse of the parts of matter. That the world had a beginning, is evident from universal tradition, and the most ancient history that exists; from there being no memorials of any actions performed previously to the time assigned in that history as the æra of the creation; from the origin of learning and arts, and the liability of the parts of matter to decay. That the world was not produced by chance, is also evident. Nothing can be more unreasonable than to ascribe to chance an effect which appears with all the characters of a wise design and contrivance. Will chance fit means to ends, even in ten thousand instances, and not fail in a single one? How often might a man, after shaking a set of letters in a bag, throw them on the ground, before they would become an exact poem, or form a good discourse in prose? In short, the arguments in proof of Deity are so numerous, and at the same time so obvious to a thinking mind, that to waste time in disputing with an Atheist, is approaching too much toward that irrationality, which may be considered as one of the most striking characteristics of the sect. The more noted Atheist, since the Reformation, are Machiavel, Spinoza, Hobbes, Blount, and Vanini. To these may be added Hume, and Voltaire the corypheus of the sect, and the great nursing father of that swarm of them which has appeared in these last days. Dr. Samuel Clarke, in his "Demonstration of the Being of a God," says, that Atheism arises either from stupid ignorance, or from corruption of principles and manners, or from the reasonings of false philosophy; and he adds, that the latter, who are the only Atheistical persons capable of being reasoned with at all, must of necessity own that, supposing it cannot be proved to be true, yet it is a thing very desirable, and which any wise man would wish to be true, for the great benefit and happiness of man, that there was a God, an intelligent and wise, a just and good Being, to govern the world. Whatever hypothesis these men can possibly frame, whatever argument they can invent, by which they would exclude God and providence out of the world; that very argument or hypothesis, will of necessity lead them to this concession. If they argue, that our notion of God arises not from nature and reason, but from the art and contrivance of politicians; that argument itself forces them to confess, that it is manifestly for the interest of human society, that it should be believed there is a God. If they suppose that the world was made by chance, and is every moment subject to be destroyed by chance again; no man can be so absurd as to contend, that it is as comfortable and desirable to live in such an uncertain state of things, and so continually liable to ruin, without any hope of renovation, as in a world that is under the preservation and conduct of a powerful, wise, and good God. If they argue against the being of God, from the faults and defects which they imagine they can find in the frame and constitution of the visible and material world; this supposition obliges them to acknowledge that it would have been better the world had been made by an intelligent and wise Being, who might have prevented all faults and imperfections. If they argue against providence, from the faultiness and inequality which they think they discover in the management of the moral world; this is a plain confession, that it is a thing more fit and desirable in itself, that the world should be governed by a just and good Being, than by mere chance or unintelligent necessity. Lastly, if they suppose the world to be eternally and necessarily self-existent, and consequently that every thing in it is established by a blind and eternal fatality; no rational man can at the same time deny, but that liberty and choice, or a free power of acting, is a more eligible state, than to be determined thus in all our actions, as a stone is to move, downward, by an absolute and inevitable fate. In a word, which way soever they turn themselves, and whatever hypothesis they make, concerning the original and frame of things, nothing is so certain and undeniable, as that man, considered without the protection and conduct of a superior Being, is in a far worse case than upon supposition of the being and government of God, and of men's being under his peculiar conduct, protection, and favour. Richard Watson (1781-1833 CE) was a missionary advocate and Christian-Methodist theologian, preacher, and author from Britain. 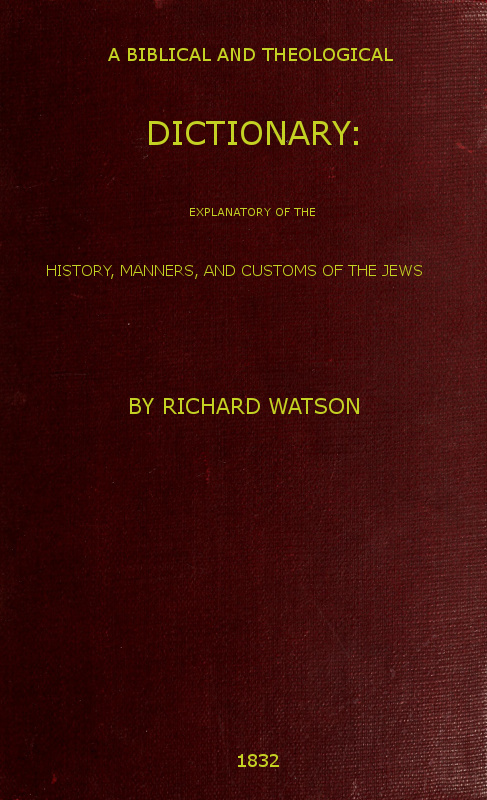 For decades, this dictionary along with other works by Robert Watson were highly influential as they were regarded as befitting an "institutional standard" quality.